Chrome plated key ring. with engravable black aluminum insert, copy will show through as silver. Individually gift boxed. PRICING INCLUDES ENGRAVING ! Chrome plated key ring. with black aluminum insert, copy will show through as silver. Individually gift boxed. PRICING INCLUDES ENGRAVING ! Clear glass book clock. Silver bezel with three-hand movement. .5" thick clear glass. Clocks supplied with lifetime guaranteed quartz movement. Individually gift boxed. Battery included. Clock, pen and business card holder on clear glass base. Laser engravable aluminum plate. 1" thick clear glass. Individually gift boxed. Clocks supplied with lifetime guaranteed quartz movement. Battery included. 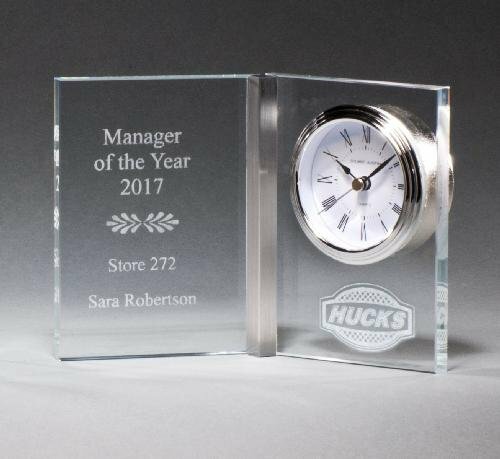 Desk clock with beveled acrylic upright, silver bezel and base. Three-hand movement, lifetime guaranteed. Individually gift boxed, batteries included.